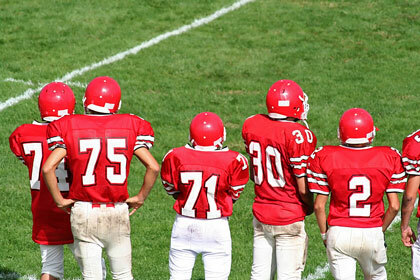 Modern American football is a descendant of rugby, which came to the United States via Canada in the late 1800s. Professional football was first introduced in 1892, and the American Professional Football Association (APFA) was introduced in Canton, Ohio, in 1920. Emma Snaith. The Independent. Sunday, 21 Apr 2019 06:10:57 GMT. Kevin Draper. New York Times. Saturday, 20 Apr 2019 07:00:05 GMT. In 1921 the organization changed its name to the National Football League, and popular early franchises included the Providence Steam Rollers, Framingham Lion Tamers, and the LaRue, Ohio Oolong Indians, which was a team comprising Native Americans. Today, the NFL boasts 32 teams divided into two conferences — the American Football Conference (AFC) and the National Football Conference (NFC). Each conference is then further divided into four divisions — east, west, north and south. Each division includes four teams. The NFL season lasts 17 weeks between the months of September and December, and during those 17 weeks each team plays a total of 16 games. At the end of this regular season, six teams from each conference — a total of 12 — have earned the right to play in the NFL playoffs. The playoffs are single elimination, and end with two teams — one from each conference — that play in the Super Bowl, which is the NFL championship. It is evident that America supports its football teams, as spectators arrive in droves to watch their favorite teams compete. In fact, the NFL has the highest per-game attendance of all the United States professional sports leagues. Each game enjoys, on average, more than 60,000 spectators. AFC football teams and NFC football teams. Official NFL site. The team names are registered trademarks of the teams indicated.